The GG sent me a link to a pic where you could see the sun rise through the Marquette oar dock. This is really cool and it reminded me that I once managed to capture the sun rising right in the middle of the Sault Ste. Siberia Ashmun Street bridge, right in the circle at the top of the center of the bridge. I think it was in 2004, about April and the GG and I were up visiting my parents and I took the photo on whatever digital camera I had then. I did not have an iPhone for a few more years. 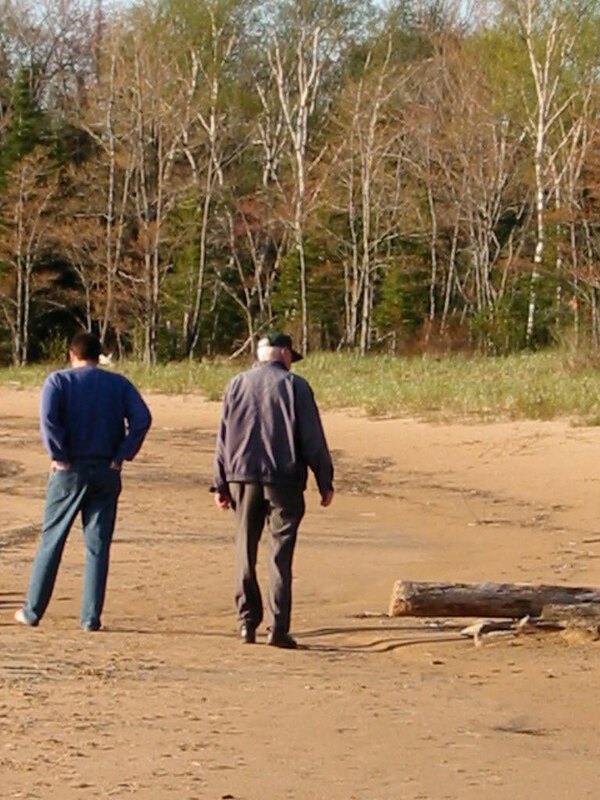 In 2004, my dad and brother were still alive and the iPhone didn’t exist. My dad probably wouldn’t have learned how to use the iPhone. My brother would have and wouldda been texting me like crazy. My mother owned an iPhone and learned how to text me. She was one smart woman. I have found that Ashmun Street pic before. For the life of me, I cannot find it tonight. I found this one instead. 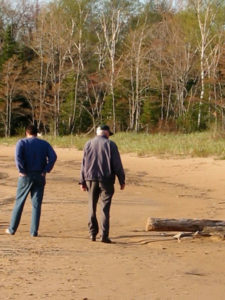 This is my brother and dad walking at the Doelle end of the moominbeach. This pic is from spring 2004. My brother died a year later and my dad died nine months after that. They almost look like cowboys, don’t they. We had a sloooow day here today with temps hanging around zero and high winds throughout the day. This entry was posted on Sunday, January 20th, 2019 at 7:56 pm	and is filed under Uncategorized. You can follow any responses to this entry through the RSS 2.0 feed. Both comments and pings are currently closed. I miss them. And I love this photo. Wonderful photo! Such a huge amount of loss in a short time. Very difficult to process. My parents have a cell phone, but couldn’t handle a smart phone.